I haven’t posted recently as I’ve been in the US of A for the last two weeks – one week of work in Chicago followed by a fun road trip (holiday) down to Kentucky and Nashville with the DH. It was great – I slept like a baby, I caught up with my dear friend in Chicago, the weather was fab and I hardly thought about work at all during that second week. …. then there’s the guilt. One of the worst things about IVF is the constant fear that you’re not doing something, or that you’re doing something wrong or that you could be doing something better. Mostly related to diet, vitamins, smoking, exercise, booze and stress. There is a whole industry built around this, preying on women who are low on luck and high on hope. There are a gazillion fertility forums dedicated to the discussion of ‘things you should definitely do to improve your chances’, most of which are not based on medical evidence but still matter in crazy IVF world. All of this distills to an overriding feeling of anxiety and… guilt. I feel guilty because I let everything slide during my holiday. I put on a few pounds (I have a bit of unwanted jiggle in the belly department). I ate everything I wanted, regardless of protein or carb content, including ice cream and awesome fried chicken. I did very little exercise apart from a couple of runs and a very long sweaty day on a bike in 35c heat. I drank a beer or two every few days. I had a coffee almost every morning. I did remember to take my supplements every day so I wasn’t completely useless I suppose. The last 12 months have been incredibly hard. I know it’s irrational to beat myself up about 2 weeks in diet/exercise wilderness but IVF has turned me into an irrational mad woman. I’m waiting for AF to arrive so I can go for a scan and hopefully start stimming next week. Now I feel guilty and worried about how 2 weeks of a small amount of booze/ice cream/no exercise may have affected my antral follicle count. Today I Will be Mostly Eating…. I’ve been thinking about things I can do to improve my lot in time for the next cycle of IVF. We’ll be getting started again in early July. That’s not a lot of time when it comes to ‘improving one’s lot’ from an IVF perspective. Do you know it takes 3 months to create an egg? Well, yes it does. So I’ve actually already made the eggs we’re going to use in early July. That doesn’t stop my brain from wanting to do SOMETHING though. So I’ve chosen two things, let’s hope they make a bit of a difference between now and then. 1. DHEA. I’ve started taking 75mg a day of this slightly scary supplement in addition to all my other supplements. Side effects include hair loss, irritability, anger and a booming voice. I’m worried I may turn into Mr Bronson but I’ve decided to go for it anyway. Studies show it can improve ovarian function, which sounds pretty damn good to me, hair loss or not. 2. 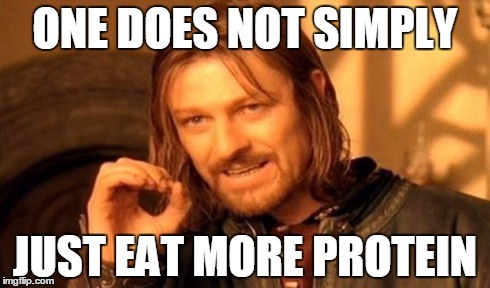 Eating more protein and less carbs. This study shows an 80% improved pregnancy rate amongst women who eat 25% or more protein in their daily diet, and less than 40% carbs. Amazing right? Sign me up…. ….I signed myself up a few days ago. Since then I’ve been keeping an online ‘food diary’ using the ‘My Fitness Pal’ app. I had no idea how hard it is to eat more protein. The first thing I noticed is that I really don’t eat that much. That is a very strange thing, because I feel like I eat loads and loads – yet I’m averaging less than 1200 calories a day. Really? Yes. My eyes are definitely bigger than my belly. I have a few mouthfuls and I’m done. This is going to become an issue, see below. So there’s that. And then there’s eating more protein. I need to eat around 90g a day which is 30% of my daily diet. So far today I have eaten a yoghurt and some blueberries (6g protein), TWO hard boiled eggs (yuck, seriously?! 12g protein), a little big of salmon and some edamame (15g protein). I’m pretty full now. And I still have to eat another 55g of protein today. WTF? How can 2 eggs only be 12g of protein? Anyway I can see the way this is going…. I guess I need to befriend the protein shake (25g protein in one drink – hooray!). As I don’t eat much meat this is going to be tough. The low carbs thing is also hard. Do you realise there are carbs in everything? I think I may have to give up sugar, bread, rice, potatoes, fruit, booze and vegetables. Not quite sure what I am going to eat for the next few weeks but it may resemble something that Fred Flintstone would enjoy. I really want to give it my best shot though. If it works, it’s worth it. Maybe I’ll develop some killer pecs in the interim. If you have any easy ways of eating high protein, low carbs in about 5 spoonfuls please let me know.